The trailhead resides at the back of the loop road that encircles the park lake. Getting there: From Austin head east on Highway 71 and drive past Bastrop toward Smithville. 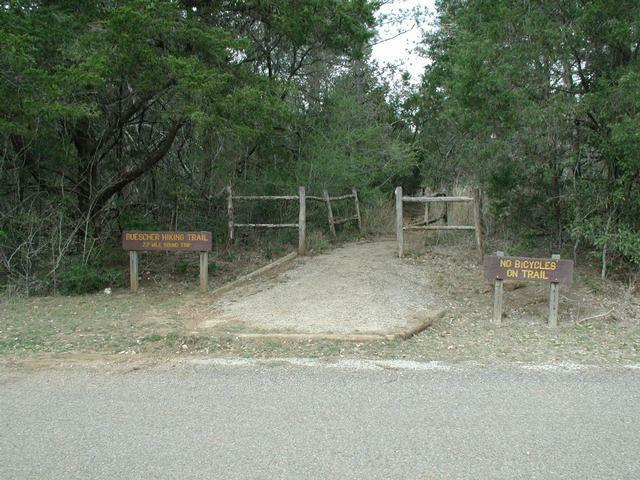 Turn left north of Smithville and head north on FM 153 for half a mile and turn left into the park. After paying for park entrance drive past the ranger station and turn right onto Park Road 1E. Drive around the small lake and look for the brown signs that mark the trailhead on the right. Parking is on the opposite side of the road. 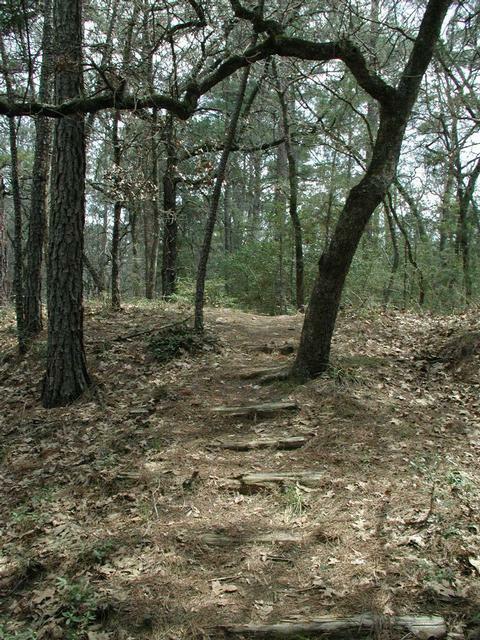 The Hikes: Buescher State Park is a sibling of the nearby Bastrop State Park. Despite its close proximity and the fact that it also features a portion of the Lost Pines the park tends to host fewer visitors. If you crave hiking solitude you can use this to your advantage. The trail starts off at the waypoint "Trailhead" and heads in a northwest direction for about 1/3rd of a mile before coming to pipeline right of way. This pipeline right of way is none other than the Longhorn Pipeline that has been in the news as of late. During my hike the pipeline crews just so happened to be working in the area, though not immediately along the trail. 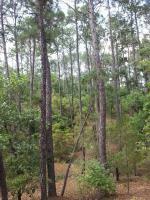 Buescher includes a portion of the mysterious Lost Pines. Not wanting to give up the hike I continued to walk along the pipeline route and occasionally had to step over erosion control barriers. Off in the distance I could see some work being done on the pipeline even though it was Sunday. Thankfully after half a mile the trail proper continued again at the waypoint "Y-Right". After a short distance back into the forest I was able to leave the commotion behind me. The trail soon turns more to the north. Although it begins to come into contact with Park Road 1C this does not hamper solitude too much. Traffic along the road is light. On nice days bicyclists may outnumber drivers. 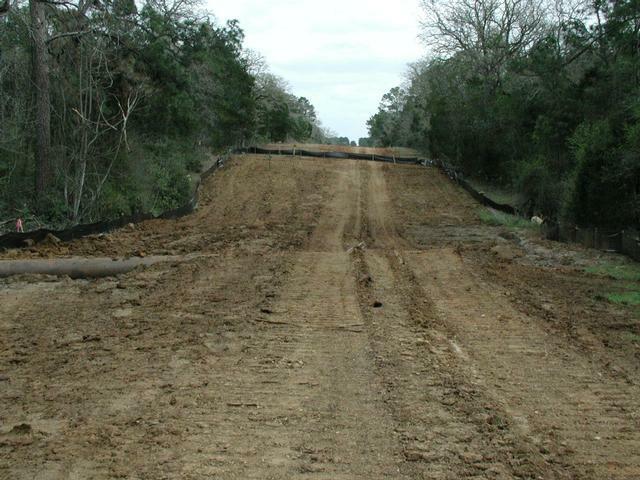 The road connects Buescher State Park with its sister Bastrop State Park. The route is quite popular with cyclists. A half mile of the trail is along a pipeline right-of-way. During my hike this pipeline was under repairs, making for a less than natural experience. Buescher State Park's shape somewhat resembles a gerrymandered Congressional district. One of the reasons for this can be found at the "Road Cross 1" waypoint. Here the trail crosses the entrance to the University of Texas cancer research facility. At some point in the past part of the park was set aside as a research campus. The remaining land snakes around this research park. To complete the full trail loop always choose the right fork in any split in the trail. Although Buescher shares many characteristics with its sibling park it does not include as many ponds, the Houston Toad's preferred mating grounds. However there is one pond along the trail visible at the waypoint "Pond". All creek crossings are easily done. Some include a small footbridge to make the crossing even easier. Prior to my hike a strong storm had moved through the area and blown some trees down and weakened others. The quiet of the hike was shattered for a moment as one of the pines finally collapsed to the ground not too far off trail. Though the experience caused me to wonder about the structural integrity of some of the trees along the trail that I passed I realized that any danger was very remote and that my witnessing the event was in a sense a bit of luck. Contrary to what the official trail map states the road crossing at "Road Cross 2" does not traverse a dirt road. That is now paved. However, the road appears to be still be quite lightly used and crossing is not a problem. 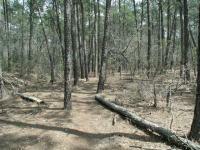 The Lost Pines are one of the most interesting hiking areas in Central Texas. Once across the road the most interesting portion of the hike begins. 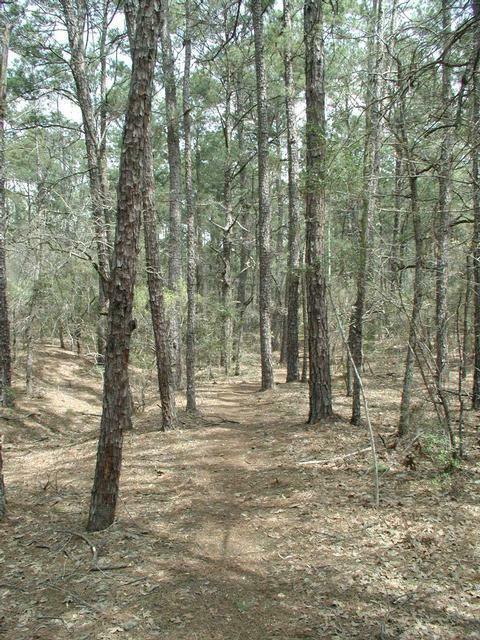 The terrain on the northwestern side of the park is more rugged and heavily forested. In some places the falling pine needles are so numerous that they hang in clumps like moss on smaller trees and bushes. The steeper terrain is cut by a number of small creeks in this portion of the park. The trail crosses many of the streams, most of which will be dry except during rains. The rougher terrain, denser foliage and fewer park visitors probably account for the group of deer that I saw on the back end of the trail. I crouched down and remained silent trying to observe them for as long as possible. Playful screams from bicyclists on Park Road 1C caused them to make a hasty retreat farther away from the road. Strong winds had knocked many trees down, including some across the trail. During my hike I heard another crash down not too far away. The trail crosses Park Road 1C at the "Road Cross 3" waypoint and soon thereafter turns to the south. I turned right at the waypoint "T-Right" in order to extend the outer loop. Going left will rejoin the trail along the park road sooner. Much of the elevation gain is found in this portion of the hike. The hiker is propelled up and down ridges until the trail meets up again with Park Road 1C and very soon thereafter with the return route back to the trailhead. During my hike on a pleasant Sunday I did not see one single other hiker on the trail. The only sign that anyone else was even out there was a wildflower book that I picked up on the way back to the trailhead, which I left at the lost and found desk of the ranger station. The book was not there on the way out, so someone MUST have been out there with me. Still, though I did not see other hikers I did see pipeline construction workers off in the distance and a few drivers and bicyclists along Park Road 1C. This hike provides ample opportunity for getting away from the crowds found on many area trails. Most of the trails at this park are closed due to the fires, but the blue trail is still open and it makes the trip from Austin worth it. Most of the trail is shaded. You'll see a ton of plant and animal life (I saw many lizards and toads among fallen leaves) and it smells really nice. There are a few times the trail crosses a small creek. Be aware of this: You'll get a little muddy and perhaps wet depending on how much the creek is flowing and how good (or not good) you are and leaping from shallow are to shallow area. The short CCC Crossover Trail is also open. It's a super quick hike, but still interesting. The stonework is fun to look at, especially since portions of it have been overgrown with moss and lichen. At the end of the blue trail there is a scenic overlook, which is a nice place to watch the sun set. You can also get to this area by driving on the main park road. The first 2 miles of the Main Trail are now open, which means you can have a 4-mile hike, which is definitely long enough to make the trip worthwhile. 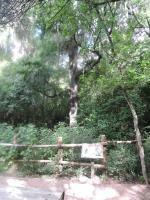 Buescher offers a much lusher, greener experience than most Austin-area hikes, winding through the Lost Pines and following a small creek. 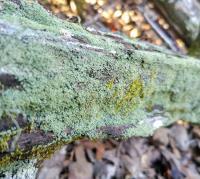 There were lots of lichens, mushrooms, true moss, and Spanish moss, as well as a number of grasses, cedars, and lots of yaupon. And, of course, loblollies. We didn't notice any fire damage, but we weren't really looking for it, either, and we were there late in the day and didn't explore the park beyond the one trail that's open. The stretch we walked didn't have a lot of elevation changes (which was fine with us) and no dramatic overlooks, but was a pleasant, intimate walk with only a few other folks on the trail. Buescher State Park is only about 30 minutes away from Austin and I had pretty much forgotten about it, despite the fact that I have passed the entrance tons of times on the way out to my parent's cabin near Winchester. With Court out of town in Dallas for her final review before her licensing exam, I decided to get out in the woods for the morning. Daylight savings hit the night before so with an extra hour, I actually woke up at 6:30 in the morning and got a decently early start. I got to the trail head by about 8:30. It was still in the upper 50s and I had to wear my jacket for the first couple of miles. 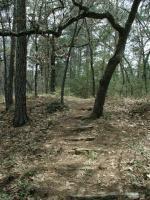 Nice trail, its not real strenuous but its nice and shady for a mid summer hike. My mileage was higher than the offical trail map because I did some doubling back here and there. I was really surprised at the low number of people hiking on the trails and the low volume of people in the park. Nice improvements to the trail! I went out to ride my mountain bike on the trails today (yes, the park allows biking as well as hiking on the trails now.) and to find some geocaches. It was a beautiful Fall day and I really enjoyed the trails. They finally moved the portion of the trail that used to be on the pipeline ROW! It is now much more scenic and interesting. 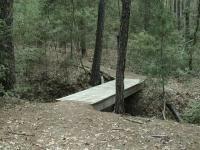 They also added a new route to part of the Pine Gulch loop. Be sure to pick up a copy of the excellent new trail map from headquarters. Granted it was a weekday, but the whole trail was very quiet and I only passed 3 other people! After the 2nd day group hike of McKinney Roughs, there was still a lot of daylight left so I decided to head over to Buescher State Park and hike the trail there solo. The trail system is a 7.7 mile lollipop-shaped trail. The trailhead is well marked and there are a number of direction signs along the trail. The main trail (blue trail) is the "stick" of the lollipop and the Pine Gulch Loop (red trail) forms the "lollipop", although there is a CCC Crossover Trail (yellow trail) that is a cutoff trail you can take if you want to hike a shorter loop. Overall, the trail is nice. There is a small pond along the red trail and it takes you through a nice wooded pine forest, but otherwise there isn't too much to see. 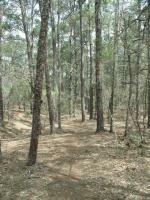 It is a nice escape for a few hours, though, and a did see a couple of white tail deer. I usually like this hike in the summer because t is so shady and relatively cool under the pines, but a friend needed to identify invasive species for her professor so I tagged along. The drought has done some real damage out here to the oaks and the pines; lots of downed wood everywhere. 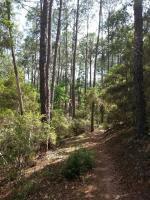 Great hike and I loved the smell of all the pine trees. It was a great hike in the middle of the day, the only problem was the road was a little close to certain parts of the trail.